If your like us, you enjoy knowing what is in the products you put in or on your body. We got so sick of going to our local Drug store and finding all the lip balms made with petroleum jelly and ingredients that we can't pronounce. Even the "healthy" alternatives are made with cheap oils and filled with preservatives. Why would you want to put petroleum, chemical, or preservatives on or in your mouth? We had to fix this.....and we did! Our Natural and Organic lip balms are 100% skin and body safe. We use an all natural blend of natural organic oils, beeswax, our honey, and pure essential oils (or *Phthalate-free Artificial Flavoring) in all of our balms. The organic oils that we use are selected for their healing, moisturizing, and nourishing properties. 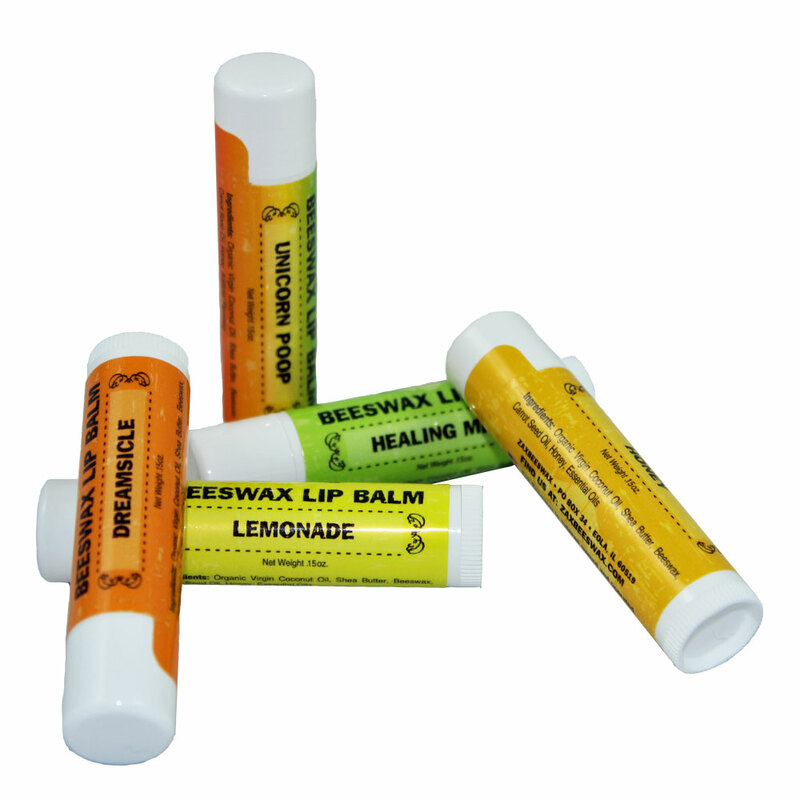 Our natural beeswax lip balms will leave your lips feeling soft and luscious instead of waxy and sticky. We offer quantity pricing! Order 5 or more balms (mix and match) and save! Click the quantity pricing tab below the "Add to Cart" button for pricing. Price will be reflected in your shopping cart. HONEY - Our homemade lip balm made without any additional flavoring. Enjoy the light natural flavor our Zax Beeswax Honey adds to this all natural oil blend. HEALING MINT - For those who like that cooling sensation on their lips! Our signature lip balm infused with Peppermint and Rosemary essential oils. Perfect for relief when your lips are damaged. UNICORN POOP - Top notes of fresh bananas and juicy grapefruit, middle notes of kiwi, juicy bubblegum, and strawberries. **Artificial Flavoring. DREAMSICLE - Orange essential oil and pure vanilla oil are perfectly blended for a delicious balm that will have you licking your lips. LEMONADE - Our signature blend of natural essential oils leaving your lips feeling and tasting of fresh lemons. So delicious my dog ate the first one! Love the smooth texture and the taste is truly delicious without ooverpowering. My lips are conditioned very well. Highly recommend. This is by far the best lip balm I have ever used! It protects and naturally softens lips, goes on smooth. It's awesome!